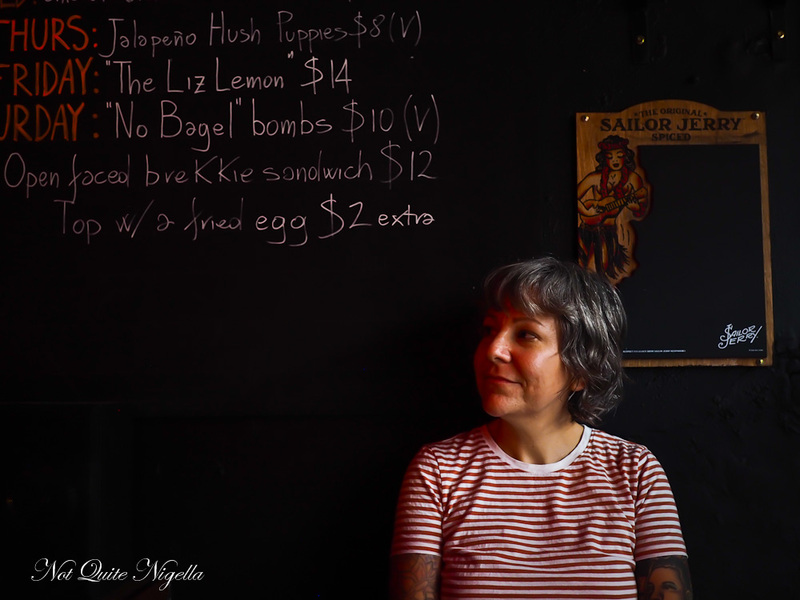 What happens when OzHarvest chef Monica Luppi pops up at The Midnight Special in Enmore? Some carefully curated dishes referencing her time living in San Francisco and travelling around regional America. 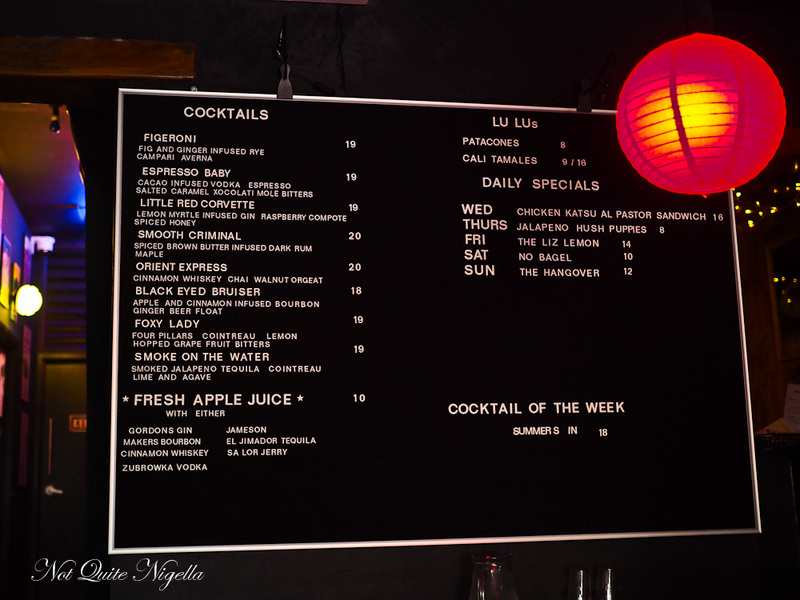 There are her delicious interpretation of tamales, a "Liz Lemon" grilled mortadella sandwich, jalapeno hush puppies or Patacones aka twice fried plantains all washed down with cocktails named Little Red Corvette, Smooth Criminal and Smoke on the Water. 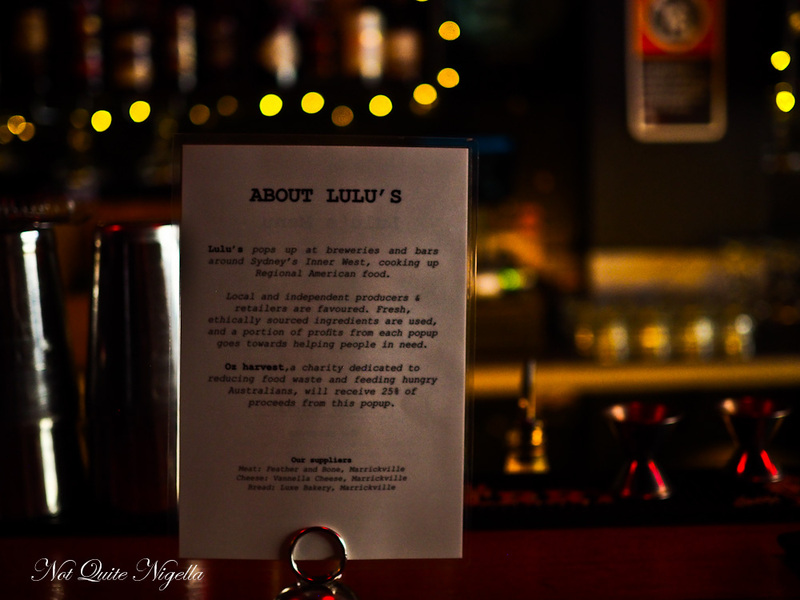 The name Lulu's is a tribute to Monica's mother, "My mum, who was an amazing cook and who I shared a love of food and eating with, passed away in 2010 and she always called me Lulu when I was being cheeky. She'd smile and kind of jokingly and very lovingly reprimand me that way." Being born in Italy and living in San Francisco, Monica is a combination of both cultures. 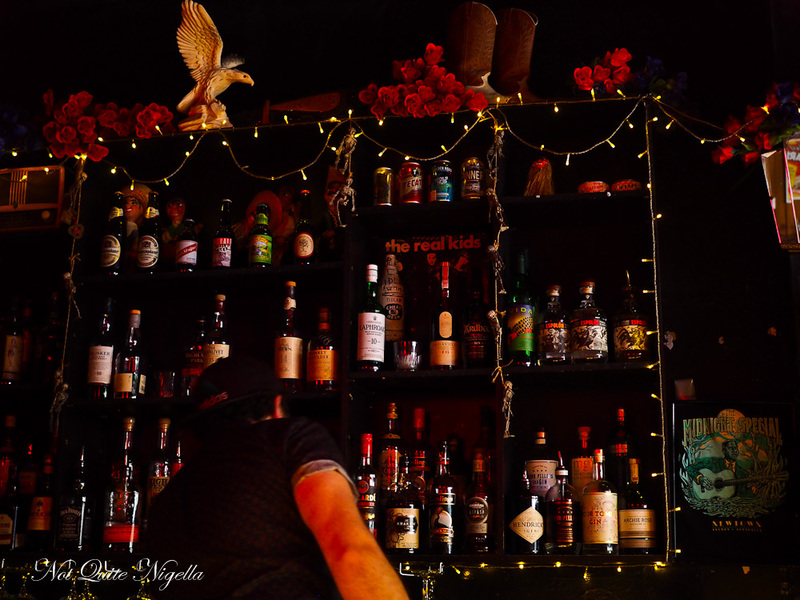 "I loved the San Francisco food scene, all the different cultures mixed together: Japanese, South American and Mexican and Korean and Chinese... and not just the food but the sheer variety of people. That's probably my favourite thing about the States. Each place is so varied and unique and there is so much diversity. Pity right now they don't seem to understand that is their greatest strength!" she says. Lulu's started by accident. "I live quite close to Willie The Boatman brewery and one day I just kinda dropped the hint, would they be interested in my tamales for a day? Surprisingly they said yes! At the same time I had a friend in hospitality who had some significant health issues that would mean he would be out of work for over a year. So we did our first outing to raise funds for him and it went really well, Willie donated a keg as well and we sold out in like 3 hours!" Then the Midnight Special came a knocking asking her if she would like to do a 10 night stint there. The only catch? She needed more than one item. Thus began a furious two week testing campaign devising dishes for the pop up. 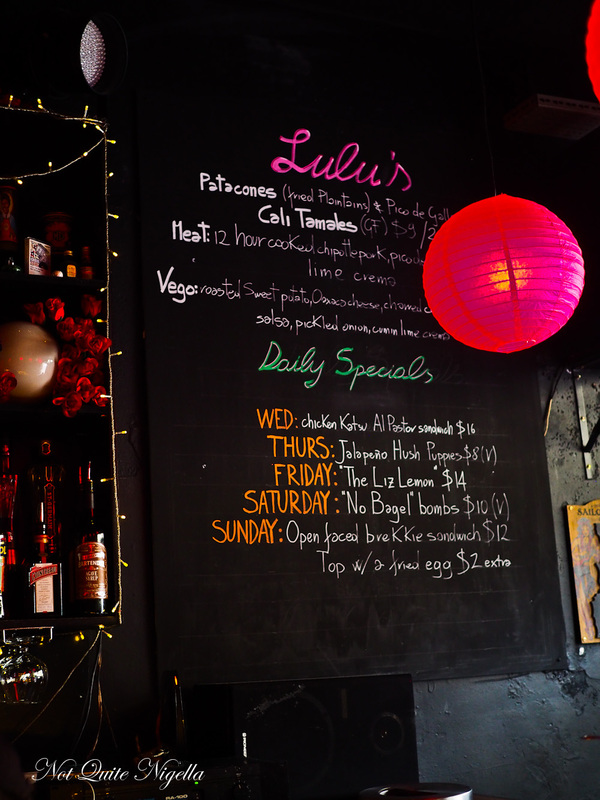 Lulu's also has daily specials. Warning: The Midnight Special is dark if you sit in one of the back booths. Like it might take you a few seconds to recognise your friends. "This is a place to take ugly dates," says Belinda. 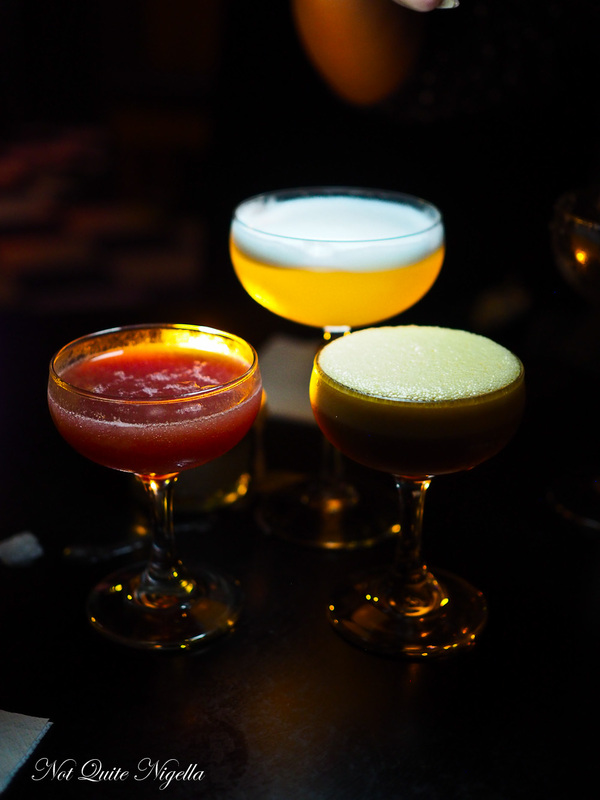 We order some cocktails, a Little Red Corvette, a Foxy Lady and a Espresso Baby. Mine is the Little Red Corvette with lemon myrtle infused gin, raspberry compote and spiced honey. It is very sweet and drinkable and you don't really taste the alcohol. We order everything from the menu but Monica also tells me that she has made me a couple of extra items. You see I first met her a few years ago at a restaurant on the Central Coast where we were both dining and we had chatted then and kept in touch. 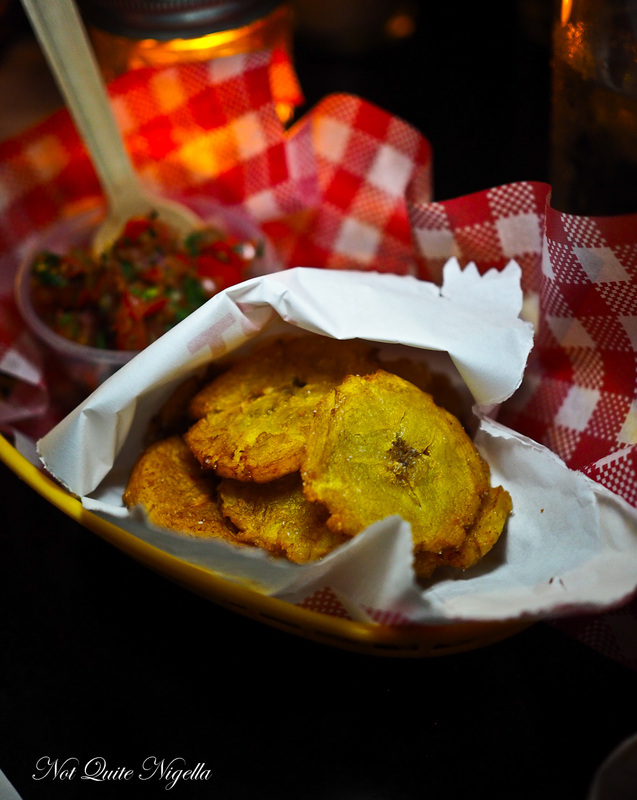 The patacones Monica says, are the bane of her existence. "This may be the last time I do these," she says of the time consuming twice fried plantain chips. We have some bad news: they are delicious and are a big hit with everyone, especially with the pico de gallo sauce so she may be stuck with them! 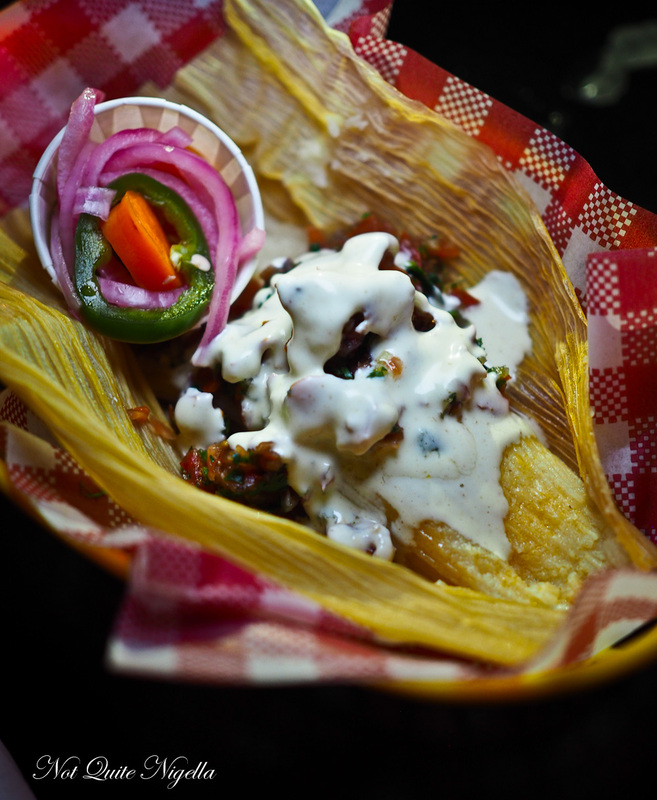 The Cali tamales come with two fillings: pulled pork and vegetarian. 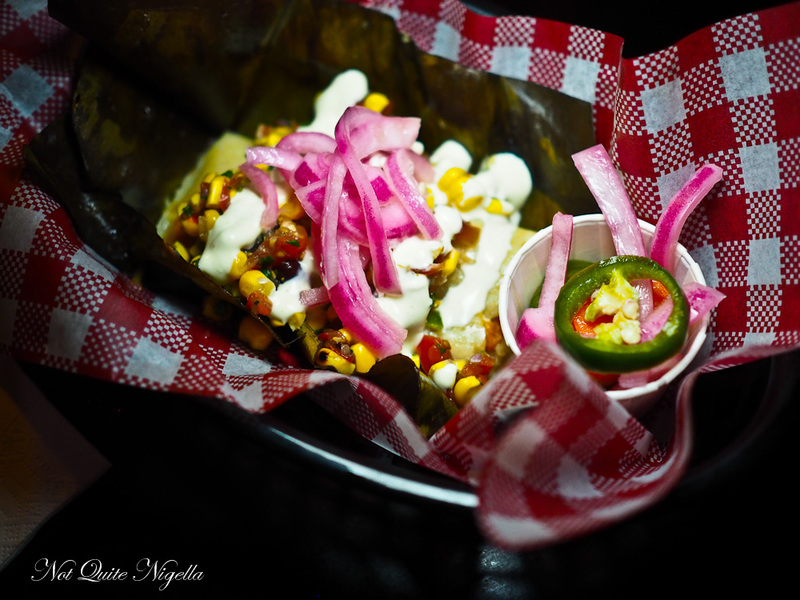 The vegetarian one comes out first and it is a corn tamale stuffed with cheese with sweet potato, Oaxaca cheese, charred corn, black bean salsa, pickled onion and cumin lime crema. Usually tamales can be quite heavy and I can never eat more than a third or half of one but the additions are what make this so moreish especially with the variety of vegetables in this. Monica explains the trick to tamales, "Tamales are really an interesting cultural phenomenon because although they are Mexican, they've been brought through to the Mississippi Delta as well and adopted by the African American community in that area, through Mexican migration in the 1800s and early 1900s. So you'll see a variety of tamale styles as you travel around the states. In the delta they roll them very thin and boil them in hot sauce, you wouldn't recognise them! Since I am from San Francisco I kinda melded them with my memories of Mission style Mexican food with the fresh salsas and accompaniments." So what makes for a good tamale especially one as light as hers? "The secret to a good tamale is the masa, the corn dough. It has to be fluffy and light, otherwise it's just a big block of starch. So for me it's good quality masa, good quality fat whipped through with plenty of air (the pork ones use lard and the veg ones vegetable shortening) and good stock for seasoning. So you get it all whipped light and put as much flavour into the dough as you can. To test whether your masa is light and fluffy you drop a tiny bit into a glass of water, and if it floats, it's good. If not, keep whipping and keep adding fat or stock!," says Monica. The pulled pork is made with 12 hour cooked chipotle pork and is served with pico de gallo and cumin lime crema. It's very good but honestly I prefer the vegetarian one as I'm not a huge pulled pork fan (I find it a bit dry in texture). 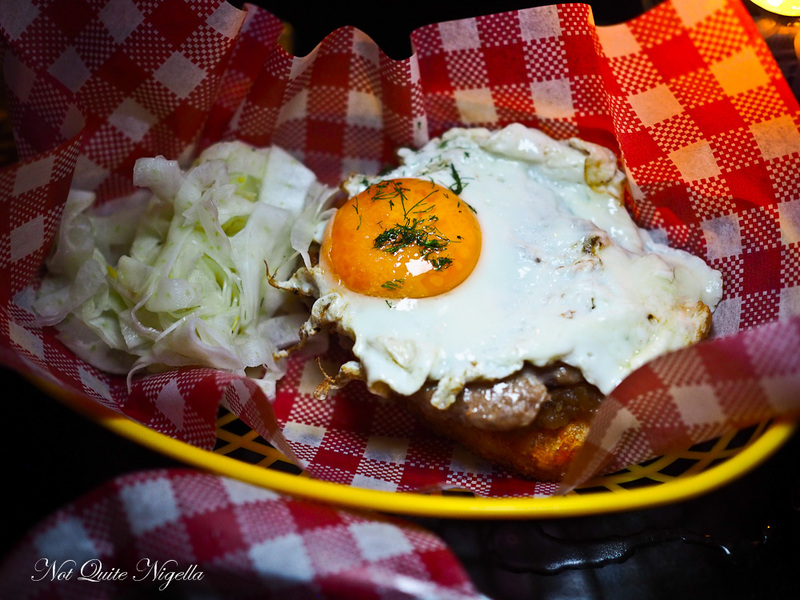 The Hangover Sunday special is a house made sausage patty with apple and onion jam served on a crispy hash brown and a fried egg on top with a side of thinly shaved marinated fennel for some freshness. This is rich and the flavour mostly dominated by the sausage patty. The hash brown doesn't quite stand up to the sausage. 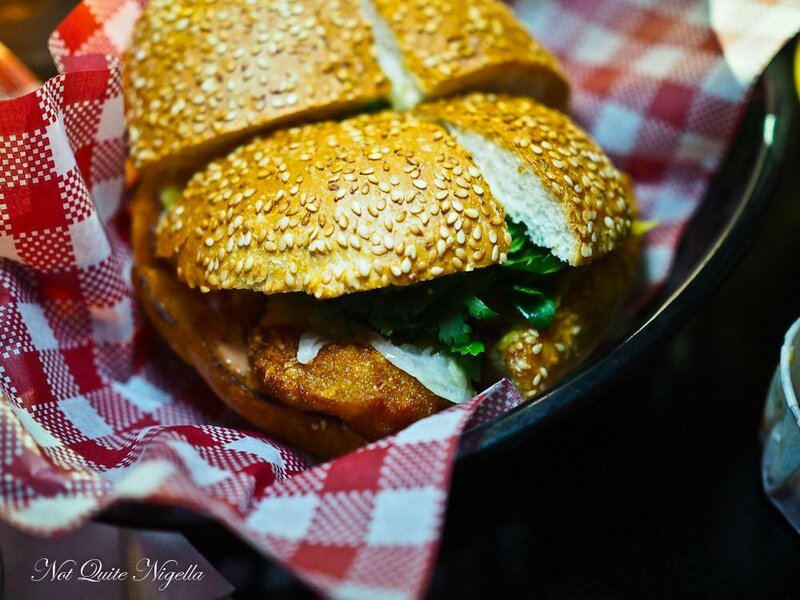 Monica then brings us out some extra treats - a chicken katsu sandwich with a crunchy chicken fillet that is marinated for a couple of days in Al Pastor flavours of pineapple and spices so that it is juicy on the inside. The Wednesday special was originally inspired by an Al Pastor sandwich Monica had at La Tradicion, a bakery and taqueria in Austin, Texas. I wish hushpuppys took off in Australia more because the first time I tried them in New Orleans I really liked them. The story goes that these deep fried cornmeal snacks were invented when Confederate troops used to silence their dogs with them while they were in hiding from Union soldiers. These soft crumbed dollops come with a delicious Cajun mayo. The only piece of bad news? The pop up ends this coming Sunday! But she will be at Young Henrys on the 4th of November and at Willie the Boatman November 11-12 too. 25% of the proceeds from the pop up will also go to OzHarvest. 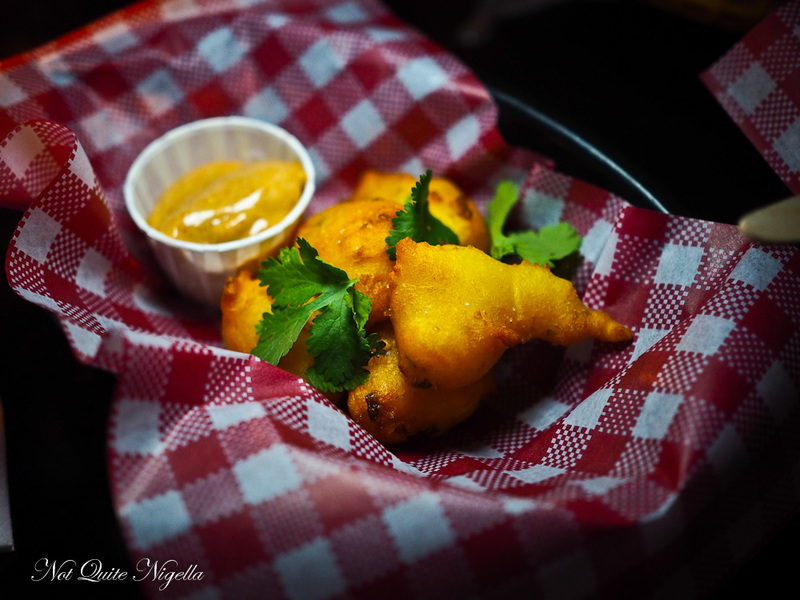 So tell me Dear Reader, have you ever tried hush puppies? Which country do you think influences your cooking style the most?